As manager of the family teddy bear shop and factory, thirty-one-year-old Sasha Silverman leads a charmed life. Well, except for the part about being a single divorcee with a ticking biological clock in small-town Silver Hollow. And that’s just kid’s stuff compared to Will Taylor, the sales rep who’s set on making drastic changes to the business her parents built from scratch–with or without Sasha’s approval . . . But before Will digs his claws in, someone pulls the stuffing out of his plan . . . and leaves his dead body inside the factory. Reeling from shock, Sasha’s hit with more bad news–police suspect her hot-tempered Uncle Ross may have murdered him. Sasha knows her uncle would never do such a thing, and she’s launching her own little investigation to expose the truth. As she tracks Will’s biggest rivals and enemies for clues, Sasha can’t get too comfy–or she’ll become the next plaything for a killer . . . In Meg Macy’s recently released cozy “Bearly Departed”, we meet Sasha and her sister Maddie, who run the family teddy bear business. When their father’s not-so-trustworthy sales rep ends up dead on the factory floor right after threatening to move production overseas, every employee is a suspect. There are a lot of characters to meet since this is the first book in the series, but by the time the murder happens we’ve met most of the cast and the mystery takes off. There are suspects galore, and it seems like everyone has his or her own secret for Sasha to discover. This was a fun entry into a new series, and I’m already looking forward to book number two. I feel so lucky to have Meg here to answer a few questions today! Please join me in wishing her a warm welcome to The Book’s the Thing. I always picture mystery authors seated at a big oak desk behind an antique typewriter. I know that’s not realistic. Where do you do most of your writing? Ever watch The Big Bang Theory? I sit in the “Sheldon spot” on my sofa! Really. I can watch the birds at the feeder in winter, the squirrels year round, see my flowers bloom, and feel awkward when the mailman delivers the mail – I’m often in my pj’s. I switch to another chair if I start feeling “blocked” and that works to keep me on track. I do have an office and a desk, but feel a little “out of sync” there. I’m much more comfortable on my sofa. Are you a pantser or plotter? Or something in between? Definitely a plotter. I’ve learned over the years it’s much easier to write more than one book a year with a detailed outline. Mine run about 8-12 pages, but far longer when I collaborate with my writing partner for the Eliza Doolittle & Henry Higgins mysteries. We often brainstorm a 20-page outline. That helps a lot, since we alternate chapters. But my own outlines leave more room for changes – see below for the reason why. Do you plan your murder first, and work the story around the solution, or the other way round? I always have the beginning and the end. The middle is tougher, but I use Michael Hauge’s story arc to help fill in all those details. Things do change, however, while I’m writing – my characters often have a different idea than mine. They might react in a new way than I ever expected, and have their own quirks, too! If it works, I’ll revise my outline. 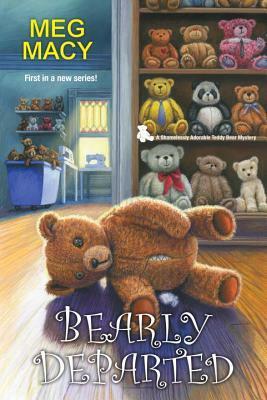 I love the setting for Bearly Departed – what made you choose a Teddy bear shop? I live in southeastern Michigan – close enough to Chelsea, Michigan, where there was a teddy bear factory at one time. It’s now located in Missouri, but that inspired me to research old photos and talk to people who did visit the factory. I often kick myself for not taking the opportunity to visit – I heard they’d moved months afterward. Rats! But I do have a Chelsea teddy bear. I had fun taking the idea and making it my own in “Silver Hollow” which is a mix of several small towns/villages in the area. When you start writing a new series, do you have a master plan to cover several books, or do you write one, and then see where that leads you? My agent submitted a two-book proposal, where I set up the village of Silver Hollow and the Silver Bear Shop & Factory. My wonderful editor loved the premise. But we agreed to revise many things about Sasha Silverman’s background and family, plus the murders. It all worked out for the best! I’m thrilled readers are already enjoying the first book. Thanks so much for having me on your blog, Erika! Thanks so much for hosting me, Erika! So glad you enjoyed the book. Thank you for coming by Meg!